Level 3 Diploma in Business and Management is a 120 credits qualification. Learners must complete 6 mandatory units worth 120 credits to achieve the Level 3 Diploma in Business. 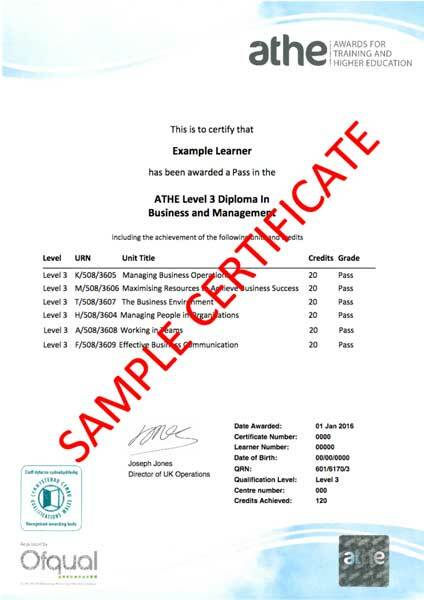 The ATHE Level 3 Diploma in Business and Management is a 120-credit Ofqual regulated qualification and is the equivalent level to an A Level or Access to HE qualification. It has been designed for learners who wish to progress to a business or management degree but may not have the traditional entry qualifications usually required. We also offer a smaller, 60-credit qualification in Business at this level. The primary purpose of this RQF (Regulated Qualifications Framework) qualification is to support your progression to higher education, specifically to a business relating course. This qualifications is approved and regulated by government regulated body Ofqual (Office of Qualifications and Examinations Regulation) to ensure consistent course quality. Successful completion of the Level 3 Diploma in Business qualification enables learners’ direct entry to BA (Hons) Business Studies degree (fee - £5500 for LSIB learners) or into Year 1 of a three-year UK Bachelor’s degree or pursue Level 4 Diplomas. This qualification at Level 3 represent practical knowledge, skills, capabilities and competences that are assessed in academic terms as being equivalent to GCE AS/A Levels. The Level 3 Diploma in Business qualification consists of 6 mandatory units for a combined total of 120 credits. - Best suited, if you wish to move at your pace. There are no forceful lectures and compulsory classes to attend. - Pay in affordable Monthly, half yearly and quarterly instalments. Cost effective - Typically UK diploma starts from GBP £3000 per annum, but with online study, you can enjoy saving more than 60% on your educational investment.